The face of Sicily in The Godfather, there is a lot more to this beautiful and charming town than a few scenes in a popular movie. Past residents have included such noteworthy minds as D. H. Lawrence, Truman Capote, and Halldór Laxness. I have never seen rain come down like this. 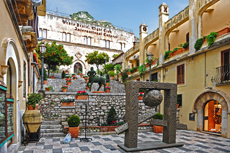 We took the 1/2 day "Highlights of Taormina" excursion offered by Oceania. We loved Taormina and wanted to spend more time there- for example, to have a relaxing lunch in a great bistro, or to see the ancient theatre. Had time for neither. Over 100 steps up to the castle ruins was not worth the effort. Over 100 steps up to the castle ruins was not worth the effort. Not much to see there at all. Restaurant for Greek lunch buffet and dancing with Opa and plate smashing was fun but too short in duration. Excursion was called "Lovely Tourmina". Excursion was called "Lovely Tourmina". Lots of shopping and lots of nice restaurants. Thoroughly enjoyed the day. Did a Taoromina tour on our own thru the cruiseline. Did a Taoromina tour on our own thru the cruiseline. another amazing place to see....cannollis were out of this world, locals were friendly. If I go back will try to get to Savoca and the Godfather. Really just driven there and left to see on our own. Large, Air conditioned bus. Took us to all the sites and allowed for plenty of time to take pictures and shop. Our guide was hard to understand. Our guide was hard to understand. We missed thetro Greco thru miscommunication with the guide. She did not seem concerned with potty breaks. Lovely town other than it poured rain, however been here in the past and it was lovely and sunny. Booked tour entitled Treasures of Messina through Celebrity. This was a tour of Taormina. I&apos;m glad we took the tour as it took us to the clock tower in time for the noon display. I&apos;m glad we took the tour as it took us to the clock tower in time for the noon display. The rest of the tour wasn&apos;t particularly memorable. Our tour guide Lana was amazing - her knowledge of history, mythology and pop culture was impressive, PLUS she got us into the Greek Theater when we had been told it was impossible. Weather was perfect, even did some pottery shopping. Taormina was amazing. We did the city and beach tour. Nice bus tour and then walking tour. Nice bus tour and then walking tour. The tour pace was a bit much for me and I had to drop off before getting to the Greek Theater. The Town was very interesting. Did some shopping, had a brief bite to eat. unique place to visit. Little train from square around the town, was ok ! One of our favourite tours. One of our favourite tours. We throughly enjoyed visiting the many shops and restaurants in town. It was a very hot, but wonderful day. We were taken by bus to Taormina and then given a walking tour around the town. We were taken by bus to Taormina and then given a walking tour around the town. We also visited the Ancient Greek Theatre which was interesting. We enjoyed the tour. The first half of the day was outstanding!